After addressing the introduction to James McGrath’s initial post reviewing Richard Carrier’s On the Historicity of Jesus I now discuss his primary focus — the Ascension of Isaiah (AoI). I should be able to say that I will discuss McGrath’s treatment of what Carrier himself writes about the AoI but just as we saw with McGrath’s treatment of Earl Doherty’s mythicist case McGrath gives readers very little idea of what Carrier himself is actually arguing. One does read at length McGrath’s own viewpoint but without fairly addressing Carrier’s own point the reader has no way of understanding the potential validity of McGrath’s criticisms. No-one reading McGrath’s review would realize, for example, that Carrier includes strong arguments for believing that significant sections of the original text describing the details of Jesus’ crucifixion and its aftermath (including a one and a half year span of time in the lower firmament) have been lost. Anyone who has read Carrier’s book also quickly realizes McGrath has read little more than the pages he is discussing. Carrier introduces the AoI as part of his definition of “the minimal Jesus myth theory”. nested in this second part is another section (11:3-22), in the view of many scholars evidently much later and quite out of character with the style and theme of the surrounding vision, that pictures graphic details of Jesus’ nativity and his crucifixion outside Jerusalem. E. Norelli, Ascensio Isaiae: Commentarius (CCSA, 8; Turnhout, 1995). These were both included in volumes 7 and 8 of the Corpus Christianorum Series Apocryphorum in 1995. Richard Carrier, like Earl Doherty, argues on the basis of the New Testament epistles that the earliest Christian belief about Jesus was that he was understood to have carried out his works of salvation in the heavenly realm and not on earth. Other texts from the era are drawn in as supporting evidence for this belief. Both Carrier and Doherty see in one of these supporting texts, the AoI, direct evidence external to the epistles for an early Christian belief that Jesus was crucified by demons in a region above the earth. How Early is the AoI? One question important to this view of the AoI’s significance is its date of composition. Scholars are agreed that the document as it exists today is a patchwork of various hands over time. So the vital question concerns the date of those sections relevant to the thesis that the AoI offers supporting evidence for the mythicist interpretation of NT epistles. 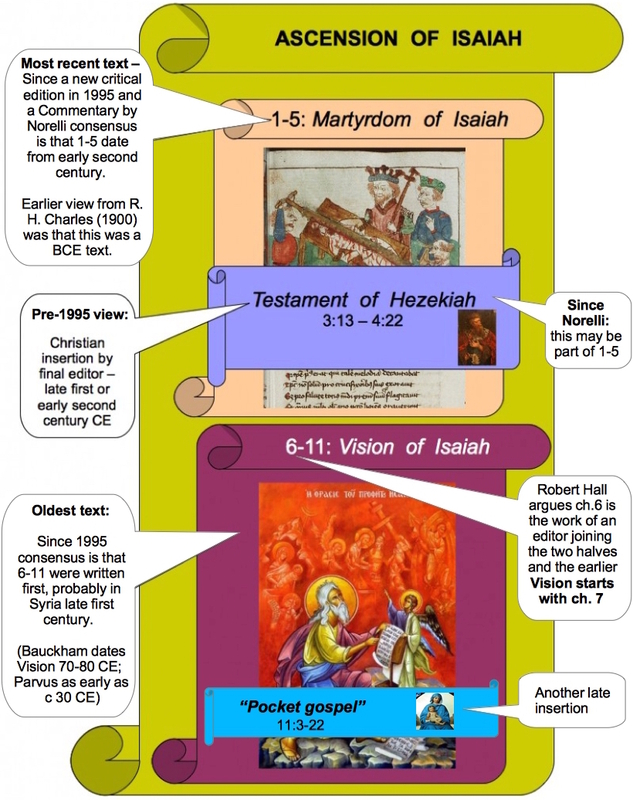 As Carrier notes, Ascension of Isaiah is a composite work, having brought together two separate works often referred to as “The Martyrdom of Isaiah” and “The Vision of Isaiah.” These two works, however, have been interpolated, whether by the author-editor of Ascension of Isaiah or subsequently. Whether details important to Carrier’s case can be dated as early as he suggests requires a careful study of the evidence. Robert G. Hall, in a discussion of the date and community setting of the work, suggests that the references to the martyrdom in the vision, and to the vision in the martyrdom, stem from the hand of the final redactor. Hall suggests that the work reflects debates also evidenced in the Gospel and Letters of John, in Revelation, and elsewhere, and he dates all of these to the early second or late first century. That is at odds with Carrier’s claim that the work ought to be dated contemporaneous with the Gospel of Mark. McGrath is confused here either with Robert Hall’s assigned date or with Carrier’s argument and his assertion is quite misleading. Yet the statements by both Hall and Carrier are very clear and there should be no such confusion. To be sure to avoid any confusion Hall stresses eleven times in his article that he is referring to the date when the AoI was put together as we know it today by the “final author” (pp. 289, 290 (x4), 291 (x2), 292, 293, 298, 299). The reference to the “final form” is made four times and to the “completed” AoI thirteen times in the article: (p. 289 (x2), 290, 291, 293, 298 (x2), 299, 300 (x2), 301 (x3)). McGrath tells us of Hall’s view that the AoI “reflects debates … evidenced in the Gospel and Letters of John [and] in Revelation, and elsewhere”. Look to see what Hall actually writes of the AoI reflecting those debates. Notice that all of Hall’s comparisons to the New Testament are found in the first part of the Ascension of Isaiah and in those isolated verses in the second part that are generally recognized by scholars as interpolations. These are the passages in the AoI depicting Isaiah being engaged in polemical debates with false prophets, often over the nature and reality of ecstatic visions. There are no direct comparisons with the original Vision passage at the heart of the mythicist case. Notice that, even with its inverted understanding of revelation, Johannine thought depends as surely on the descent and ascent of the Christ as the Ascension of Isaiah does on that of the Beloved. The Gospel polemicizes against those who, like the author of the Ascension of Isaiah, base revelation on heavenly trips to see God instead of on the descent of Jesus. “Not that anyone has seen the Father except him who is from God; he has seen the Father” (John 6:46 [RSV]; cf. 1:18; 5:37; 1 John 4:12, 20). “No one has ascended into heaven but he who descended from heaven, the Son of Man” (John 3:13 [RSV]). This Johannine polemic parallels the charge of Belkira in the Ascension of Isaiah against those who claim to see God (Asc. Is. 3:7-10) and the disbelief in ascensions into heaven among those who see Isaiah’s trance (Asc. Is. 6:14). There is therefore nothing in Robert Hall’s article that calls into question the date of the original composition of the section about the Vision of Isaiah. In fact, when we place Hall’s observations beside the new standard view since 1995 it becomes necessary to date the Vision of Isaiah (chapters 6 or 7 to 11) earlier than the Gospel of John and Revelation. Since 1995 scholars have assigned the Vision (6-11) to the “period when the later New Testament documents were being written — the late first century CE.” Bauckham dates the AoI to 70-80 CE. Hall wrote his article before 1995. Since then scholars have felt even more comfortable assigning the Vision (6-11) to the “period when the later New Testament documents were being written — the late first century CE.” (Jonathan Knight, “The Origin and Significance of the Angelomorphic Christology in the Ascension of Isaiah“, The Journal of Theological Studies, Vol. 63, Pt 1, April 2012, p.71). Richard Bauckham, influenced by Norelli, goes further and thinks the AoI should be seen as a single, not composite, work and that it should be dated between 70 and 80 CE (Bauckham, The Fate of the Dead, p. 389). James McGrath presumably dates the Gospel of Mark prior to 70 CE. And so a dating of Ascension of Isaiah to around the time of the Gospel of John, when mainstream historical study concludes that the earthly Jesus of the earlier Gospels had begun to be transformed into an earthly Jesus who embodies a pre-existent divine entity, creates difficulties for the trajectory which mythicists envisage. As I have shown from Hall’s words above McGrath has seriously misread Hall. It is the final form, by the final author, the completed text, that Hall dates to the era of the Gospel of John. Chapters 6 or 7 to 11 of the AoI appear to have preceded the Gospel of John. McGrath has misread the article he cites. Or he has not grasped the fact that the key section of the AoI is dated earlier than much of the remainder. He has even overlooked Carrier’s own discussion of the comparative date of the Vision section. What, then, of McGrath’s claim that the AoI cannot be dated as early as the first Gospel? If the completed AoI can be dated to the late first or early second century as Hall suggests then dating the Vision half of the AoI as early as 70 is very plausible. McGrath ought to have at least explained to readers Carrier’s own arguments for dates as well as for dating the Vision earlier than the rest. As his review stands, uninformed readers are falsely led to think McGrath has simply identified errors in Carrier’s work. Yet McGrath’s criticism implies that Carrier’s mythicist argument stands or falls on the AoI as its central element. McGrath is not done yet with the date of the AoI, however. He returns towards the end of his review to associate Carrier’s use of the AoI with his supposed manner of using the Talmud, a work from 200/500 CE. He gratuitously assumes, contrary to Carrier’s own explanation of his use of the AoI, that Carrier will use the text in order to interpret the writings of Paul. But the attempt to drive apart sources which naturally cohere, separated in time by a mere decade or two, only to then bring in still later sources and use them to interpret the earlier ones, is clearly problematic. Carrier uses the AoI as part of his definition of mythicism by showing how similar the thought of the Ascension is to passages in Paul’s epistles: God’s plan to sacrifice Christ to defeat death was a secret hidden from the world and only made known by revelation; that none of the spirit rulers of the world understood it or they would not have crucified the Lord. Using texts as supporting evidence is not the same as using one to interpret the other. Hopefully McGrath can eventually grasp that point. And so it is important in concluding to notice what we find in Carrier’s treatment of Ascension of Isaiah, which is mirrored in his treatment of the Talmud, the Apocalypse of Zerubbabel, and other sources. Late sources are brought into the picture, with not-implausible arguments for their containing traditions that are much earlier. But these arguments for the presence of earlier tradition are no less weighty than the similar arguments that have been offered concerning traditional material about a historical Jesus being found not only in the Gospels, but also in the letters of Paul. The attempt to use later sources, interpreted in ways that are at best open to dispute, in an attempt to argue against what generations of skeptical scholars have concluded to be likely with respect to the early Christian sources, is never going to make mythicism seem more probable than the hard-earned and intensely-researched consensus of historians and scholars, namely that there was a historical Jesus of Nazareth. a dogmatic insistence that a hypothesis of a ten year difference between the date for the Gospel of Mark and the Vision of Isaiah demands us to remove from all consideration the possibility that any idea expressed in the Vision could ever have existed prior to 70 CE. Suddenly, with that paragraph and especially its final sentence, McGrath has swept aside all the arguments for a first century date for the Vision of Isaiah and its significance as a first-century text. McGrath quotes a 2012 article by Jonathan Knight in order to stress the fairly obvious fact that, given the various manuscript lines, scholars cannot always be absolutely sure of the original text. Bauckham . . . dates it in entirety to the first century (70 –80 CE ). While this approach is exceptional among recent work on the apocalypse, it does confirm the early date of the apocalypse, which by universal consent contains first-century elements. . . . While dating is in some respects a subjective matter, the general recognition among scholars that the Ascen. Isa. contains first-century elements is remarkable and makes the neglect of this text quite astonishing. . . . In sum: we have a work of two halves and two centuries. The original part of the Ascen. Isa. [chapters 6-11] comes from the period when the later New Testament documents [i.e. those that understand “the pre-existence of the Christian Messiah” – p. 89] were being written—the late first century CE. The second half comes from a more acute situation of crisis in the early second century, when the authors felt attracted by the Isaiah narrative with its interest in martyrdom. . . .
We see that McGrath could have selected quotations from the literature he read that supported Carrier’s argument as I have done here. Despite the inability of these texts, therefore, to decide the debate either way, McGrath imagines a possible reason they may have been original after all and subsequently removed. This is, of course, entirely speculative and McGrath appears to have overlooked Carrier’s response to another scholar making the same “speculation and not an argument” on pages 36 and 37. In his reviews of Doherty we saw how often McGrath jumped in with criticisms on the assumption that the argument he had begun to read would at no point address certain questions he believed were fatal to the thesis. He repeats the same mistake in his review of Carrier’s book. He forgets that the early pages he is reviewing are a “definition” of the minimal mythicist argument and does not even consult the index to see if his questions might be addressed in the more substantive argument in later pages. As a result he makes another “gotcha” criticism of Carrier’s point, the same one, in fact, that he made when discussing Doherty’s argument. It is a shame he did not listen to the replies then; had he done so he could have avoided making the same mistake twice. There is, however, a common element of ancient thought which has important implications for the understanding of Ascension of Isaiah. In 7:10 we read, “And as above, so also on earth, for the likeness of what (is) in the firmament is here on earth.” As Carrier notes, “the narrative goes out of its way to explain that the firmament contains copies of everything on earth.” And yet, presumably because of his aim to present a case for mythicism, Carrier does not discuss the natural implication of this: that even if the celestial Beloved only descended as far as the firmament, and was crucified there by demons, this would mirror some corresponding occurrence on earth. But as we have shown here, even if Ascension of Isaiah does have this view, that the celestial Beloved descends from the highest heaven to the firmament and no further, then that still does not support mythicism. Ascension of Isaiah emphasizes that what happens on the firmament is mirrored in the terrestrial realm. We should not treat the crucifixion of the Beloved to be an exception. . . . This would have a counterpart in the human realm, and so would presumably have been understood as a “behind the scenes” (or “above the firmament”) picture of the celestial-spiritual correspondents to events that ancient Christian sources consistently presuppose to have unfolded in the vicinity of Jerusalem in the not-too-distant past. McGrath excoriates Carrier for supposedly using later text, the AoI, to “interpret” earlier ones yet turns around and uses very much later (second and third century) texts to interpret first century chapters of the AoI! Even the examples McGrath gives of other docetic texts to buttress his point should have warned him of his mistake here. McGrath quotes at length from the Second Treatise of the Great Seth and the Apocalypse of Peter to show that the crucifixion on earth was paired with a corresponding event of Jesus laughing in heaven. Such examples should have reminded McGrath that the pairing of events above and below does not mean (and never did mean in the ancient world) a precise one-for-one correspondence of details. However, McGrath failed to learn from the feedback offered to him three years ago. This certainly seems to say Jesus died in outer space. Because here we’re told that Jesus not only performed his sacrifice in the celestial temple (as in Heb. 9 . . .), but that he had to do so. Otherwise the magic of it wouldn’t have worked. We’re also told that Jesus wasn’t ever on earth — instead, he could only have been God’s celestial high priest (so as to perform the ultimate sacrifice) if he wasn’t on earth. . . .
Of course the heavenly sacrifice had its counterpart on earth and Carrier did indeed address this. McGrath spent in excess of 700 words air-boxing. McGrath pulls out another objection from his monochrome preconceptions about docetism to declare that docetists believed Jesus, even if only in the appearance of a human, appeared on earth. In support of this he reminds us that the realm of malevolent spirits included the entire region below the moon and extending down to earth. But the real error McGrath makes here is forgetting what Carrier has been pointing out and what the AoI text itself clearly says. The Beloved is to enter into the lower firmament. There is no mention of earth. Yes, elsewhere demons appear on earth, but we can’t let that fact cause us to ignore the narrative in the text under study. Why Carrier suggests that those with whom he disagrees would view the similarities as “coincidence” is unclear. As Charles Talbert has conveniently summarized, there are many common motifs across a wide array of traditions which believed in some sort of descending and ascending redeemer figure. Exactly. And given that Carrier himself in this and other publications includes the works of Charles Talbert in his bibliographies I believe we can assume Carrier is well aware of Talbert’s explanation and is expressing implicit agreement with it. I am reminded of McGrath’s other posts, and the anti-mythicist works of Maurice Casey and others: mythicists are not only intellectually wrong; they are also basically bad people, too. It is important for anti-mythicists like McGrath to fault mythicists morally as well as intellectually. In discussing Carrier’s treatment of the text, we have granted a number of points which are in fact open to dispute. I’m not sure which ones he did actually concede. There were several others I did not address here that he countered by pointing out that alternative views and interpretations can be advanced — even if only as speculation. McGrath did “concede” that Carrier was correct to point out that some Jews believed that the dead went “up” to a place of spirits rather than “down” to hell. But in the same breath McGrath cites texts that point to much later Jewish works that demonstrate the alternative belief in going “down” to hell. Simply posing alternatives like that is pointless unless one can wrap them in an argument to demonstrate which view is the more likely one in the context being discussed. And that’s the whole point of Carrier’s book — to work through the probabilities of the different explanations and assess the most likely explanations. McGrath is fond of preaching to mythicists that simply suggesting an alternative explanation is not itself sufficient. One must also demonstrate that one view is more plausible than another. McGrath seems not yet to have grasped that that is the very theme of Carrier’s book. He still appears to find solace in an argument on the basis of counting heads who have long assumed it to be true. The overall tone of McGrath’s review is professional. One assumes it could not have appeared on Bible and Interpretation otherwise. But the failure to grasp the argument he is reading, the failure to read beyond the pages he is discussing, the failure to explain to readers the substance of what he is reviewing, the failure to present a logically valid argument, the tendency to speak in vague and unsupported generalities and speculations and to fall back upon the authority of tradition and dogma — all the problems we saw so regularly back in 2011 when he attempted to review Doherty’s book are still with us in this first instalment of his review of Carrier’s book. Perhaps not always to the same extent but still there. Posted on 2014-11-01 14:34:02 GMT+0000 by Neil Godfrey. This entry was posted in Biblical Studies and tagged Ascension of Isaiah, Christ Myth Hypothesis, James McGrath, Richard Carrier. Bookmark the permalink. McGrath raised one worthwhile question concerning where the ancients thought sheol was located, but other than that McGrath only rehearses the same bad arguments he typically uses. I must say, I am pleased with myself that I, a mere blog commenter, saw the same issues with McGrath’s article. Thank you for explaining the whys and hows that I couldn’t. Of course, you couldn’t keep Carrier from eventually replying even if you wrote a book refuting McGrath. Too bad we’ll probably have to wait because Carrier is on the road so much right now. I’d lay odds that the Martyrdom and Ascension were originally one text written by Christians. Theologians have been applying mini-Documentary Hypotheses to all Biblical texts since the late 19th Century, when DH Fever first took hold within the seminaries, but it’s mainly a circular argument. If the text doesn’t mention Jesus, it must have been originally Jewish, they say. If it does mention Jesus, those must be later Christian interpolations. So the parts of AoI 1-5 that mention “the Beloved” are interpolations. The underlying (false) assumption is that Christians wouldn’t be able to write the Martyrdom of Isaiah on their own. Why not? Knight and Bauckham both argue for it all being a single text originally. Against this, however, is that the Martyrdom’s text indicates at several points that it does not know of the Vision — as if it was composed as a discrete unit without reference to the Vision. Since the work of Norelli et al I think it is more widely accepeted that the Martyrdom is indeed a Christian text. Carrier argues also that we can infer missing parts from Ch.11 right around where the text is broken up by the “pocket gospel.” If you read that part carefully you see that the prediction\prophecy of 9:14 (the god of that world will hang Jesus from a tree) is never fulfilled. In fact, the actual experience of Isaiah is anti-climatic, never describing the sacrificial event at all (accepting that the “pocket gospel” is an assertion which is a consensus view, I think). Carrier infers from that observation that the text here has been altered and should continue to follow the pattern of the Chapter 9 prophecy as was the case to that point. Am I summarizing this correctly (I am sitting in the jurors’ assembly room, so I don’t have OHJ with me). The climax of the experience of the Beloved One is the confounding of the demon spirits and his glorification ascension, not the crucifixion. And yes, it is the consensus view that the “pocket gospel” is an insertion. Simone Petrement in “A Separate God” seems to think that Ascension of Isaiah comes from a Simonian school. I think she may be correct. Roger Parvus has been posting a series here setting out a case for a Simonian origin of Christianity. This post of his argues that the Ascension of Isaiah was one of Simon’s sources.